And so we come to part three of our discussion of the Assassin's Creed series. Once again my partner in crime is Joseph Rositano from Australian videogame website PALGN, and in this particular exchange we discuss mostly mechanical inclusions: the collectibles, weapon and enemy variety and the videos of the intriguing Subject 16 character. Before we get to that I'd like to quickly apologise for the delay with this post. Life commitments on both sides meant we had to hold off for a while but the good news is everything is back on track and our discussion about Assassin's Creed II can continue. Away we go. Joseph: Hi Steven. Well, I have decided to take a break from the main story (though I believe I’m not too far off from completing it) and have started hunting down the various collectibles in ACII. I hadn’t actually realised this until now but the paintings you purchase from art merchants are automatically hung in Uncle Mario’s villa. I never even noticed those blank frames in the building. It was by chance that I bought a random painting and walked past it in the foyer when I was visiting the place. I think it’s actually a pretty neat, though somewhat limited, idea. It reminds me of Luigi’s Mansion for the GameCube, how you’d turn ghosts into portraits and then be able to view them in the Gallery. I actually did a Year 12 Case Study on Roman art, so it has been interesting to see how many of the pieces reflect on mythological, historical and legendary figures – Ubisoft certainly did their research! Another collectible I found interesting were the eagle feathers. Obviously these replace the flags from the original Assassin’s Creed, but are a little more meaningful due to the way the story is integrated. 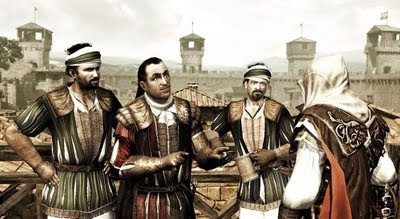 I won’t say too much as we’re planning on doing an in-depth post relating to the plot, but I actually want to collect all of them just for Ezio’s mother. I got about half of them and was even rewarded with a new weapon, which is certainly more appealing than a couple of achievement points. Also, is it just me or are the feathers easier to find than the flags were? It might be because most of them hang on ledges and are out in the open, or it could be because they’re a blinding-white colour. Either way, I think Ubisoft has balanced it out more. The new weapon and enemy varieties have also taken my interest. While I still prefer using the tired and proved sword, I like how the hammer, axe and spear feel different and add some strategic elements to the gameplay. For example, using a sword against Brutes is next to useless. Being bigger and well-armed, Brutes are able to easily defend and knock you back. After a few encounters however, I discovered they weren’t so good at dealing with the hidden blade, so now whenever I see them I automatically switch to that weapon. It makes fights in later scenarios a little more interesting actually, particularly when you have to combat different enemy variants at the same time. Aside from the Brutes there are regular guards and enemies which are a little more agile than most; in other words if you run away they can chase you and land a blow or two. One thing I didn’t like however is how you have to go to the villa every time you want to change weapons, surely a simple visit to the nearest blacksmith would have sufficed? Another captivating feature is the Subject 16 videos. What I like mostly is how you can be walking past a seemingly innocent building and then an info screen pops up saying one of Subject 16’s videos are there. I tend to completely drop what I’m doing and investigate it. Normally within a few minutes I can find the puzzle that unlocks the video, though there have been a few that I couldn’t locate immediately. Out of interest, what is your take on the puzzles? There’s a Da Vinci-like vibe coming from them, and they certainly have varying difficulty levels. Some puzzles, for instance, just have you highlighting where a Piece of Eden is in a photo, while others have you breaking codes and spinning circles around to complete a full painting. It almost feels completely disconnected from the main game itself, yet at the same time has that Assassin’s Creed feel to it. Of course, it does help the puzzles make revelations on how the Pieces of Eden have been passed down through various dictators and world leaders throughout history. It’s certainly a nice little side-story and makes the Pieces of Eden a little more impacting than they were in the first game. Steven: I think that, like everything else, the collectibles in Assassin's Creed II are well considered and implemented in a way that makes sense within the boundaries of the narrative, unlike the flags of Assassin's Creed, but it's also too easy to look past the simple explanations Ubisoft provided and see them exactly as they are: mechanics that mostly mean nothing to the overall experience and are provided to extend a player's time, potentially, in the game. That said, I'm a completionist so I actively seek these things out by default and, unlike other like-minded gamers, I actually enjoy chasing after hidden collectibles as I use it as an excuse to spend time in a game's world and take it all in. Assassin's Creed as a series in particular provides awesome, awe-inspiring locations that are very enjoyable to just spend time in, so the flags, feathers, treasure chests and whatever else Ubisoft decide to throw our way are definitely objects that I will pursue throughout the course of the game. While I do see these collectibles as the distractions they are, I still appreciate that the developers took the time to associate them with the characters we meet throughout our travels and the elements of play we interact with -- it just makes it more cohesive, something I've come to really admire most in the games that I play. I'm quite surprised actually that people aren't complaining about the treasure chests. To me, it feels like there are too many and as we all know a lot of people complained about the amount of flags there were to find. I suppose these treasure chests are located in easier to reach areas and are more obvious to spot than the flags, but out of the chests and the feathers it is the latter that I prefer to try and find. Lastly, I am pleased that Ubisoft tracked these collectibles via maps or information in the pause menu. It meant I was able to head to the cities in the game where I was still missing a few instead of wasting time searching an area where I had already acquired the hidden collectibles. Being a sequel, it makes sense that Ubisoft wanted to include more weapons this time around. I remarked in our discussion of the original game that a lot of people found Assassin's Creed's combat to be too easy due to the use of the X button (360 controller) for attacking and defending. Despite this being largely true, the issue didn't bother me as I enjoyed mixing my combat up and trying to choreograph my own epic fights, making the combat more enjoyable for me personally. 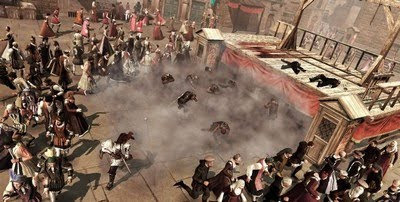 Assassin's Creed II's combat is undoubtedly improved but it is still too easy to rely on that X button, the enemies you face and the weapons you use varying the dynamics of combat rather than player input. While I understand that this occurs in order to benefit accessibility, I still find it an issue when it's up to the player's initiative to make combat varied and unpredictable as opposed to the game's dynamics. As you say, there are different kinds of enemies in ACII that do change things up, but I just feel the changes aren't enough. There's the sword for normal enemies, the more agile ones and even the archers on the rooftops, whilst the hidden blade is effective against the spear-wielding Brutes. It's just too easy in my view to fall into a routine that dispatches foes quickly and allows you to escape or continue pursuing your objective. But, I want to be clear here and say that I absolutely love the combat system -- the way it feels, the different ways foes can be dispatched, the animations as Ezio counters and conquers and, of course, the way it all sounds -- and I believe that it suits the needs of the game and accommodates a player's desire for the most part, it's just the ease for repetition through routine that is my sticking point as opposed to the actual act of fighting. I don't know, I guess you could say that I feel as if sometimes the combat feels artificial as a result of its accessibility, which is disappointing given how visceral and satisfying it can also be. Experimenting with the weapons, or even techniques (such as throwing dust into enemy eyes) was good fun though and I'm definitely glad some more variety was included. Subject 16's videos were certainly interesting but they felt too abrupt and broke the flow of immersion for me a little. It's explained through the narrative well enough -- Subject 16 being the Abstergo Animus experiment before Desmond, who left messages inside the Animus' code before his untimely demise -- but it was still jarring as far as I'm concerned. 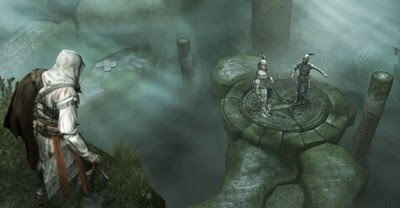 Reminding you that you're in the Animus reliving an ancestor's memory isn't the problem, nor is the implication of a nearby glyph and the discovery of it, but rather the actual puzzles you work with. They're static for a start, meaning you're staring at what is mostly a blank screen so the focus can be on what you're supposed to do -- find the hidden Piece of Eden in a picture; arrange layers of a wheel to form a picture -- and once you've started one, you can't stop and save it for another time. You must complete it to continue on, which is fine when they're easy and pose a quick distraction but is frustrating when you are struggling to solve it and would like to continue playing. It's a trivial thing, to be sure, but I feel as if they detract too much from the overall experience to justify their inclusion. Like the additional weapons and enemies above, I admire the inclusion but don't find the execution to be as fleshed out as it could have been. At the very least, the Subject 16 videos do flesh out the narrative somewhat so in a very convenient segue-way, what are your thoughts about the plot, characters and events of the game now that you've finished it? As implied above, our next exchange surrounds the narrative of the game and what we thought of it. Depending on the flow of conversation, we'll either wrap the series up there or have a shorter conclusion afterwards to summarise our overall thoughts about Assassin's Creed II. In the meantime, if you have any thoughts regarding what was discussed above or indeed in the series so far, feel free to jump in and have your say in the comments.